The article about our arangement for Pink Saturday, is in the magazine this month!! A resident in Plus Bolig makes support arrangement for the fight against Breast Cancer. Saturday October 3, is Pink Saturday. Dozens of collection events will again this year mark the nationwide Pink Ribbon campaign by the Cancer Society across the country. One of the events will be at the c One of the events will take place in public housing in Plus Bolig department at Hellevangen in Aalborg SØ. 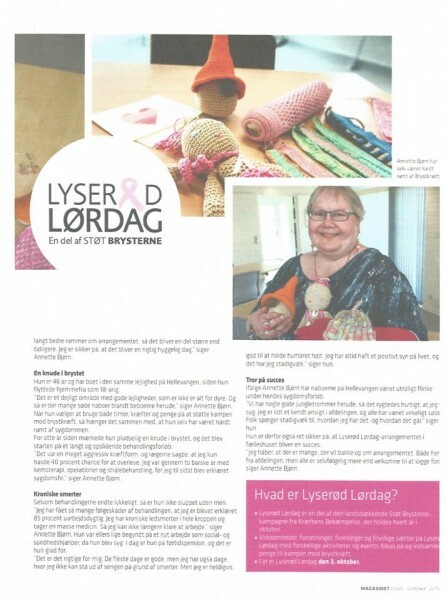 “We are really happy that we can have our arrangement for the Fight against Breast Cancer in our Public House,” says Annette Bjørn that is in charge of the collection arrangement in the common house of Hellevangen. Pink Saturday is a special day for collections, which takes place all over the country. 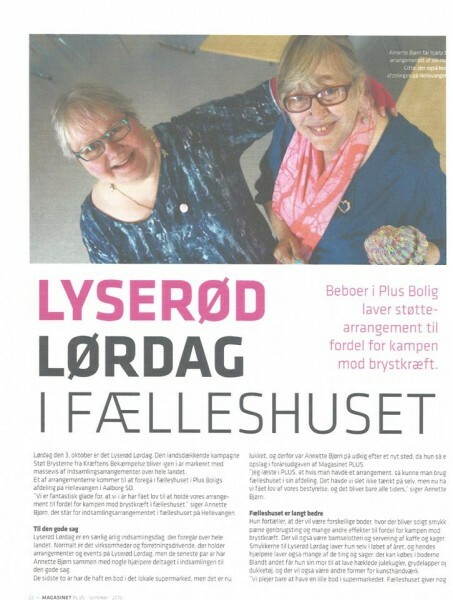 Normally it is businesses and shops, that makes arrangements and events on Pink Saturday, but the past years Annette Bjørn and some helpers – family and friends – has taken part in the good cause. The past two years they have had a stand in the local supermarket, but that closed down, and AB was on the lookout for a new place, when she noticed a small note in the PLUS Magazine. “I read in PLUS, that if you had an arrangement, you could use the public house connected to the place you lived. We had not thought of that ourselves, but we got the rooms, and it is going to be so great,” AB says. She tells, there will be different stands, where they will sell jewellery, nice second hand things and many other things to support the Fight against Breast cancer. There will also be a Teddy Bear Lottery, coffee, and cake. The jewellery for PS, she makes through the year and her helpers make many of the things you can buy at the stands. Among other things, her mom make crochet ornaments, potholders and doll clothes, and there will be many other handmade crafts. “We used to have a small stand at the supermarket. The Public House give us much better terms here, and it will be much bigger than before. I am sure, that it will be a really nice day,” AB says. She is 46 years old, and have lived in the same apartment on Hellevangen, since she moved away from home at the age of 18. “It is a great place here with nice apartments, that is not to expensive. And there are a lot of great neighbors among the people here,” AB says. When she chooses to spend many hours, effort and money to support the fight against breast cancer, it is because the disease has hit her hard. Eight years ago, she suddenly felt a lump in her breast, and that was the start of a long and grueling treatment. “It was a very aggressive kind of breast cancer, and the doctors told me, that I only had 40 % chance of surviving. It took two hard years of operations, chemotherapy and radiation therapy, before I was declared, “cancer free”, “AB says. Even if the treatment ended well, she didn´t came out of it without injuries. “I´ve gotten so many consequential damages from the treatment, that I have been declared 85 percent incapacitated. I have chronic joint pain throughout my entire body and takes a lot of medication. So I am not able to work anymore,” AB says. She had just started a new job as a “social and healthcare helper”, when she became ill. Today she is on disability, and she is happy for that. “It is right for me. Most days are good, but I have days where I cannot get out of bed because of pain. However, I am good to keep my mood up. I have always had a positive sight on life, and I still feel that way,” she says. According to AB, the neighbors at Hellevangen have been amazingly during her illness. “We have some nice grapevine here, so the word about my illness got out really soon. I am a known face here and everyone, have been so amazingly nice. People still ask me how I am doing and how I feel,” she says. Therefore, she is confident that the Pink Saturday arrangement at the public house will be a success. “I hope a lot of people will come to our arrangement, from here, but everybody are more than welcome to stop by.” AB says. Pink Saturday is a part of the Breast Cancer campaign that take place every year in October. Businesses, shops, and other people focusses on Pink Saturday with activity, evens, and collects money for the Fight against Breast Cancer. This year PS is on October 3. Ohhhh, this is an awesome article!! So proud of you!! You are a strong, sweet, brave and kind woman - and this article highlighted that most of all!! Bless you, darling...and good luck with PS!! I´m so happy too, and if it turns out well, we´ll book it again for next year.